Many interested adopters associate golden retrievers with being great family dogs, but there is much more that comes along with the breed. Goldens are one of the smartest, most energetic dogs around, and learning the basics is a great place to start in understanding if a golden retriever is right for you. Golden retrievers originated in Great Britain in the 1860s and were first brought to the United States in the 1890s. The American Kennel Club recognized the breed in 1925 as members of the Sporting Group. Goldens are “people” dogs. They need to be with, around, near, on the lap or underfoot of humans because they thrive on love and attention. They cannot be maintained as outside dogs. Consider your lifestyle and household schedule. Do you travel a lot? Do you work long hours? Are you busy with children’s activities? In other words, do you have time to give the love and attention a golden needs? 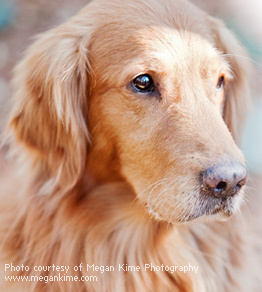 Goldens are active, exuberant, inquisitive, busy, nosy dogs who have a naturally outgoing disposition. They are generally good family dogs, but no dog should be left alone with children. Goldens are retrievers, and they love to carry items in their mouths. Don't be surprised to see them carrying around toys, laundry, and even shoes! Male goldens are just as affectionate as female goldens (some people would say more affectionate). Goldens need to be exercised daily, or they may have trouble becoming the well-behaved dogs we expect them to be. Dogs will not exercise by themselves. Goldens that do not get enough exercise can exhibit behavior problems such as inappropriate chewing, excessive barking, unruly behavior and digging. Senior goldens also require daily walks and playtime in order to stay healthy. Goldens are medium to large-sized dogs. Males range between 23”-26” at the shoulder and weigh between 75-105 pounds. Females stand between 21”-23” and weigh between 55-85 pounds. Goldens possess active tails, making clean sweeps of coffee tables. The average life span of a golden is ten to twelve, although they can live longer. Consider what your plans might be in five to twelve years. Will you still welcome the responsibility of a highly social dog when you have a family, go back to work, have an “empty nest” when the kids go to college or when you retire and want to travel? Goldens are a long-haired, double-coated breed, and they shed constantly. Because of the coat, brushing every other day is to your advantage. Professional grooming is another option. They need to have their toenails cut regularly, and many goldens need to have their ears cleaned frequently. Both tasks are simple for the dog owner to do. Like any other dog, goldens get ticks and fleas and their paws will track dirt, mud and snow into the house. If you want a fastidiously kept home, DON’T GET A GOLDEN! You will always find some dog hair around, especially on rugs, furniture, and nicest clothes and, oh yes, occasionally in your food.